It's ironic that the aspect of golf that is most to do with touch and feel has become a game of power. The sport's leading stakeholders are staring each other down over the controversial move to outlaw anchored putting techniques and the stakes have been raised significantly by the opposition of the PGA Tour. Commissioner Tim Finchem made some startling claims when he outlined his stance against the proposals. He believes there is no statistical evidence to show that controversial anchoring techniques provide players with a competitive advantage. On this basis, he argues, the governing bodies - the R&A and United States Golf Association (USGA) - have no reason to throw out the technique. Finchem also claimed that a fifth of amateur players are now using the anchoring method and that it is now too late to call time on a putting style that has become part of the game. In citing these reasons he has put his Tour on a collision course with the two transatlantic bodies that set the rules for the game. And while Finchem claimed he doesn't envisage schisms in the running of golf it is hard to see any other outcome if both sides stick to their guns. "We think if they were to move forward, they would be making a mistake," Finchem said. That's a pretty clear indication of where his organisation stands. But if the next set of golf rules published in 2016 don't include the proposals put forward last November it will represent a humiliating climb-down for the R&A and USGA. Effectively Finchem has challenged the rule-makers to provide statistical data to back their claim for a need to change. They might want to start first with the results of the leading broom-handle exponent on tour. "All you need to do is look at Adam Scott's history at Augusta National," respected analyst Brandel Chamblee told the Golf Channel. "He never averaged under 28 putts until he put the long putter in the bag, and he did; and he finished second." Chamblee added: "He played in 40 majors without a long putter and he's had four Top 10s. And he's played in eight since he put the long putter in the bag, and he's had four Top 10s since then and two second place finishes." Finchem counters this point by saying: "What the data shows is that there isn't an anchoring putter on the PGA Tour that's in the top quartile in putting stats." That maybe the case but there are many poor putters who have made themselves efficient enough to win big tournaments. Open Champion Ernie Els is a prime example. Given the PGA Tour's opposition to the changes, it is worth recalling the reasoning of the governing bodies when they announced the move. "Throughout the 600-year history of golf, the essence of playing the game has been to grip the club with the hands and swing it freely at the ball," explained Mike Davis, the executive director of the United States Golf Association. "The player's challenge is to control the movement of the entire club in striking the ball, and anchoring the club alters the nature of that challenge. "Our conclusion is that the Rules of Golf should be amended to preserve the traditional character of the golf swing by eliminating the growing practice of anchoring the club." If Finchem's statistics are to be believed then the practice is growing at an alarming rate. "Twenty percent of amateurs are using it according to some data. So thousands of people have gravitated to the method." These are figures that are surprising, to say the least. 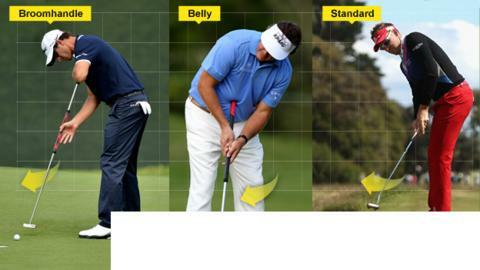 How many club players do you know using broomhandle or belly putters? Finchem and the PGA of America who represent the country's club pro's believe the game will be ruined for thousands of amateurs who now depend on the technique. But the R&A and USGA set the rules for the good of the game. If the rule change is genuinely going to drive away players then perhaps they should think again but it's a scenario I find hard to believe. The PGA Tour's opposition is more to do with its members. The Tour is run by the players for the benefit of the players. Look at the way they deal with disciplinary matters by not publishing fines or bans. That secrecy benefits the players but does nothing for the transparency of the sport. The Tours shouldn't make the rules because the game is far bigger than them. "We follow them, we don't make them," says European Tour boss George O'Grady. Finchem, who runs the biggest and most lucrative circuit in the game, has signalled a more confrontational stance. This putter issue has the potential to go to the heart of who runs the game. Ryder Cup hero Ian Poulter told the BBC of his fears that "things could get very messy" and Colin Montgomerie has echoed those sentiments. "To now go against that and say 'my players aren't going to go by that' then what happens when you come to USGA events (US Open) or the British Open? Does that mean you have to use a different club?" Montgomerie said. "We want to play as one under the same rules." There is one area of agreement. These rules should have been brought in when the technique first surfaced a quarter of a century or so ago. But in the context of a 600-year-old sport it is surely not too late to right a wrong. The 90-day consultation period which expires on Thursday is coming to an explosive end. It's the rule-maker's move next. Who will blink first?